The Makita String Trimmer is part of the legendary line-up of power tools. Makita is a world-wide manufacture of tools for the professional and industry. The USA branch is located in California, so it is no surprise their string trimmer is fully compliant for the EPA phase II, CARB tier III requirements. Makita made the grade by using an efficient 4 stroke engine ( no oil mixed with the gas) which provides excellent fuel economy. Makita describes this engine as ‘commercial duty’, with potential fuel savings of 60% compared to a similar 2 cycle engine. Both of the trimmers offered feature the same 4 cycle engine. The difference between the two models lies in the handle configuration. Both trimmers feature a solid steel, straight drive shaft. The Makita model EM4250CA and EM4251CA are both equipped with 25.4cc four cycle engines. Since the engine is a 4 stroke, there are many more moving parts ( a two stoke engine has only 3). Weight could be a problem, but Makita has managed to weight in at a reasonable 11.5 lbs, which compares favorably to other trimmers in it’s class. The handle is the primary difference in the two models Makita offers. Model EM4250CA is designed a ‘brushcutter’, with a bicycle-style handle as standard equipment. This allows for better leverage when using the steel blade to cut through thick underbrush and small trees. Both of these situations could result in a dangerous ( and fatiguing) kickback. Using an handle that separates the hands away from the drive shaft allows for much better control. 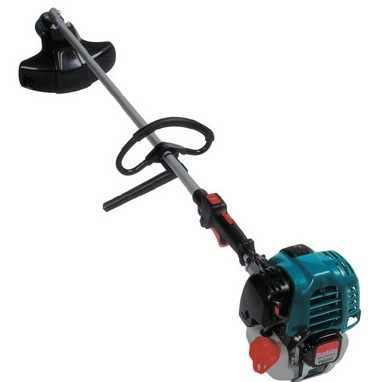 Model EM4250CA is primarily a string trimmer, with the standard loop style handle. As an added benefit, a short straight handle is also placed on the drive shaft, allowing a little extra leverage when needed for the really tough jobs. The string head is of the bump and feed variety. The Makita String Trimmer line seems to live up to the Makita name of quality engineering and performance.